It's difficult to sum up seven years of work with the Gevatron and the Gilboa Quintet in a few hundred words. My beginnings with the Gevatron were like the beginning of a Kafkaesque story. 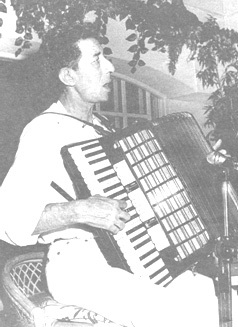 I was in my mid-twenties, and as a member of a kibbutz, had answered the call of the hour and was working as a shepherd, with dreams of music. One day, after bringing my flock of sheep down from the Gilboa pastures, I went into the shack where I lived, turned on the "wind-dripper" (There were no air conditioners then, even in hotels.) and fell asleep. Just before the dreams of approaching autumn began, I woke up and saw a man with an enormous moustache bending over me, and he was saying: "Hello Nachtche! My name is Ze'ev Havatselet. I have been appointed to organize a big performance in the untilled fields just outside of Tel-Aviv (the exhibition gardens of today). I was told that in Geva there is a group of kids who sing, and in Beit-Alpha there are a few newly discharged soldiers who used to have a little band before they were drafted. Go over to Geva, see what this Gevatron is all about, and put together an amateur group." So my noonday rest hour ended while I was still bemused in thought: "Maybe there's something in it," I thought, while making my coffee. That evening I went over to Geva. I met Rina Firstenberg (the Gevatron's mommy), and we clicked immediately. The beginning wasn't easy. Then one clear morning, a young fellow showed up saying: "My name is Yaakov Sagi, from Ein HaShofet. 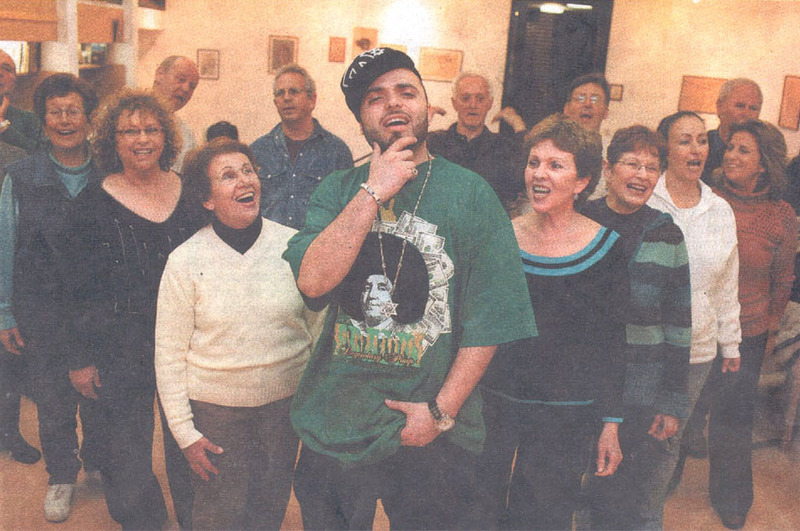 I heard that you organized a singing group in Geva," and went on to say, "Take this melody I composed to a poem by Nathan Yonatan and write an arrangement for the Gevatron." That song, "Song is Bursting Out Again," was the trigger. It wasn't long before we started recording, and I must say without exaggeration that by the time our ways parted after the Six-Day War, more than fifteen records had been published. I passed the Gevatron on to the conductors who followed, and was left with memories of "the seven good years." What can I say to you, members of the Gevatron, on your holiday. I was fortunate that it fell to my lot to work with you and to be able to celebrate your award together. The term "you deserve it" pales somewhat before the simple truth, because – wallah – you deserve it! It is no secret that the kibbutz movement in Israel has slipped into decline these past few decades, many having chosen very substantial privatization instead of the collective arrangements that were their classic hallmark. More than a few that still carry the designation kibbutz have by now sold their lands to developers; their members, who work where they find employment in the private sector, own their own homes, send their children to private school (if they can afford to), are charged per item for meals taken in the dining hall (which they rarely are); their kibbutz has become, for almost all practical purposes, a self-governing village. Not so Geva, which was founded in 1921 and is one of the 35 or 40 kibbutzim that remain very much within the collective tradition. Six hundred people (300 of them children) live here; of the adults, only 25 or 30 are employed in agriculture dairy cows, sheep, almond orchards, grains, fish ponds (carp and St. Peterג's fish) and 110 in Baccara, the kibbutz factory that produces electric valves for industrial systems, gardening and agriculture. It's a $40 million dollar enterprise ($15 million in exports), with growing subcontracting arrangements in China. Four or five of Geva's members require 24-hour-a-day nursing care, and the kibbutz provides it, as it provides electric wheelchairs for the elderly who need them and spiffy three-bedroom homes for young couples who want them. Such are the ways of a real kibbutz. 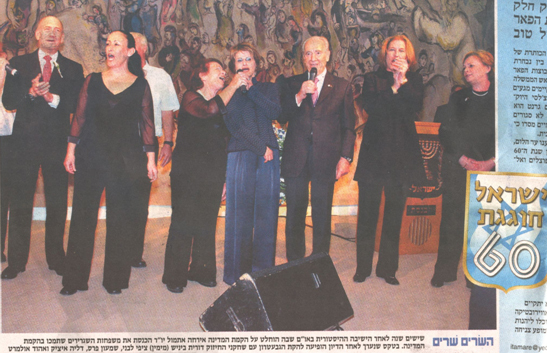 Geva is best known in the country for its 15-member folk choir, the Gevatron, winner last year of the Israel Prize, awarded annually to individuals and institutions that have made distinctive contributions to the society. 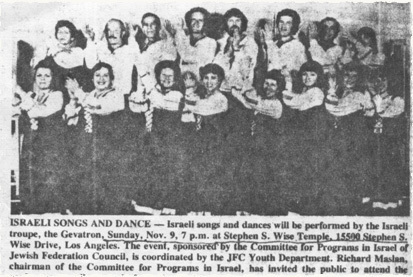 Founded in 1948, it performs worldwide and some 50 times a year here in Israel; its mix of the latest folk songs and the most popular oldies continues to draw sell-out crowds, as was the case the other night at the Mann Auditorium in Tel Aviv at a concert attended by 2,800 people. Over the years, the members of the Gevatron have become my friends. They've visited me in Boston four times and whenever I'm in Geva, once or twice a year, we spend an evening together. There's a functional spread cheeses, herring, breads, watermelon and wine, whiskey and soft drinks. We chat and munch for no more than half an hour and then Gidon takes his guitar in hand and we sing, typically for a couple of hours. Full disclosure: I am not a singer, nor the son of a singer. I say we sing because I sing along, sort of, confident that they're strong enough to overwhelm my too often off-key renditions. The singing is not, however, for my benefit. They really don't have all that much to say to each other; one manages a computerized lathe facility in Baccara, another drives a truck, another's a nurse. Their songs are their connection. All this by way of introducing a passing moment from my June visit. We gathered in a somewhat ramshackle shack at Geva, usually a hangout for kids in their late teens, decorated for reasons no one can recall with photographs of harness racing. We'd finished off more than a few bottles of excellent wine (Gidon's son is now a vintner) and were well into a set of especially rousing songs when Yoel's cell phone rang. On the line was Ilan, the Gevatron's gifted musical director and accompanist, calling with the sad news that his father had died. His death was not unexpected, but when Yoel passed the news to the group, there was an immediate shift in temper. And Roni began to sing, and others joined in, a quiet Naomi Shemer song, an adaptation from Psalm 55: Listen, God, to my prayer and don't overlook my plea. Who will give me wing so I can fly and live like a bird? I will call God and he will save me. (The original Psalm is much, much darker.) And that was followed by the familiar Avinu Malkeinu, which was the only song my mother retained as she lingered after the stroke that finally took her. 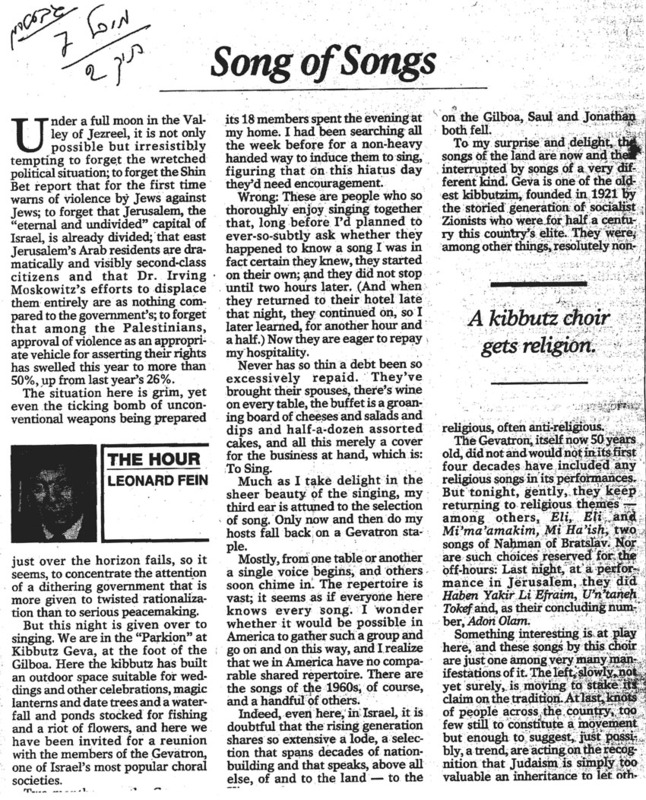 It is, I think, of more than passing interest that so many of us including kibbutzniks who are entirely secular in outlook revert to religious language in times of stress. It's not foxhole religion that takes us there; it's more nearly an adaptive mechanism, an evolutionary response for dealing with mystery, for finding a place of solace in the face of the otherwise unfathomable. So we sing our longings and I note that without conscious intent, three of the columns I've written here in Israel have dealt with song: Shir LaShalom, the Yemenite nusach during the Torah reading at the bar mitzvah I attended in Jerusalem, and now this. Perhaps, I muse, that is one way I deal with the often unfathomable mystery called Israel. 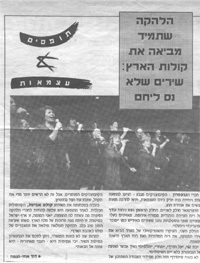 Members of the Gevatron – the kibbitzniks from Geva came for a one and only performance in New York on independence day. And made the holiday spirit for many people. The audience was also honoured by the presence of Collette Avital, general counsul, who after the performance thanked the Gevatron and said: I am amazed, this is Israel at its best. This was a concentrated dose of "the Salt of Israel". Something that warms the heart. This wonderful group has filled our batteries with the love of the Country.